Here's the next installment of our BSN supplement stack guide - the BSN True Mass weight gainer. I'm sure most, if not everyone is familiar with, and probably have used a weight gainer at one point or another. 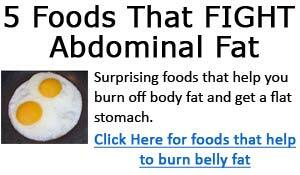 They're a great way to get additional calories in your diet and nutrition. However, from many of the emails I receive, I get the sense that there are some users who do not have a clear understanding of weight gainers. It is true that a weight gainer is designed to help you put on weight, but it is NOT a guaranteed means to weight gain. If the combined caloric intake of your weight gainer and your regular daily nutrition does not create a caloric surplus, you will not gain weight. It's as simple as that - create a caloric surplus, and you will gain weight, and this can be achieved without weight gainers; however, using it will make life easier, when a typical serving provides over 600 calories, there are weight gain supplements that provide over 1,000 calories per serving. Therefore, a weight gainer providing higher amounts of calories per serving will also require additional scoops (serving weight) per serving. Let's compare 2 weight gainers real quick as an example. Muscletech's Mass-Tech provides a whopping 830 calories per serving where as BSN True Mass provides a more "average" 600 calories per serving. So does that make Mass Tech a more effective weight gainer? No, of course not. One serving of Mass Tech is 5 scoops totaling 220g of powder, whereas one serving of True Mass is 3 scoops totaling 145g of powder. As you can see, bigger serving size translates directly into more calories. Finally, when comparing two weight gainers, you need to look at the serving size in grams, not in number of scoops. Different supplement companies will use different sized scoops - so the only objective way to compare is on a gram-for-gram basis. When choosing a weight gainer, I generally favor those gainers that have a lower carbohydrate to protein ratio - in the ranges of 1.5 to 2. That just means that for every gram of protein in a serving, there should be about 1.5 to 2 grams of carbs. I tend to pass on weight gainers that provide insanely high amounts of carbs where the protein to carb ratio can go as high as 3 to 1 or even 4 to 1. While this isn't a golden rule to follow, it makes good sense on many levels. Quality protein costs much more than carbs (2lbs of dextrose sells for under $4 bucks), so supplement makers can save money by stuffing a lot of "weight" in to a gainer by loading up on carbs and skimping on protein. While the above guides provide a good framework for choosing weight gainers, it's not a definitive guideline. The weight gainer you choose should fit in with your diet and nutrition planning. If your diet is already high on carbs and needs more protein, choose a weight gainer that has a low carb to protein ratio. On the other hand, if your diet is heavily loaded on protein and needs more carbs, go for a weight gainer with slightly higher carb to protein ratio. If you've used True Mass, share your review and feedback here. Vitamin A 5000iu, Vitamin C 60mg,Calcium 250mg, Iron 18mg, Vitamin D 400iu, Vitamin E 30iu, Thiamine 1.5mg, Riboflavin 1.7mg,Niacin 20mg, Vitamin B6 2mg, Folic Acid 400mcg, Vitamin B12 6mcg,Biotin 300mcg, Panothenic Acid 10mg, Iodine 150mcg, Zinc 15mg, Copper 2mg. Other Ingredients:A Sustained release ultra premium protein matrix comprised (ultrafiltered whey protein concentrate rich in alpha-lactalbumin, microfiltered whey protein isolate rich in whey isolate peptide fractions, calcium caseinate, micellar alpha and beta caseins and glutamine peptides and glutamine AKG, l-leucine, l-isoleucine, and l-valine), maltodextrin, dutch processed cocoa powder, richmix sunflower powder, litesse II polydextrose, natural and artificial flavors, nutrisperse mct powder consisting of (medium chain tryglycerides), Vitamin and Mineral Blend, cellulose gum, xantham gum, gaur gum, gum acadia, acesulfame potassium sucralose, lecithin (soy), aminogen and paptain. Allergen warning: manufactured on equipment that processes products containing milk, egg, soybean, shellfish, fish oil, tree nuts and peanut flavor. Each serving of BSN True Mass is 145 grams providing 75g of carbs and 46g of protein - a carb to protein ratio of 1.63. Various weight gainers have different mixes of protein content to meet different purposes. For example, a weight gainer containing only whey protein is more fit for an after workout shake to replenish glycogen stores and feed your muscles with some fast absorbing protein. Whereas a weight gainer (such as True Mass) is more appropriate for use throughout the day because of its protein blend, which provides a sustained release mix of protein. 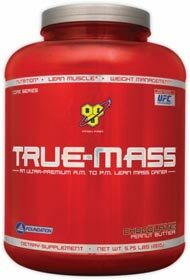 BSN True Mass comes in the 3 standard flavors: chocolate, vanilla, and strawberry. I'm not a fan of any strawberry flavored protein supplements, so I almost never try them. However, I used both chocolate and vanilla flavors, and they both tasted good. True mass was easily mixed as well without clumping. Very little effort and shaking is needed for a smooth, completely mixed drink. Again, always remember that your choice and use of a weight gainer should fit in with your overall diet and nutrition planning. Do not simply "wow" at a weight gainer simply because it provides obscene amounts of calories. Use a weight gainer to fill in the protein and carbohydrate gaps of your daily nutrition, and you will see results.